I'd never usually wall Code Geass and I know this scan has been used many times already but I really liked it so I decided to make my own version. I rotated Lelouch to fit the background I had in mind which was made from scratch. The original version featured hills in the background but I deleted that and replaced it with the ocean. Vectored the lines and then painted the rest. The pillars and rocks didn't initially have moss on them but I thought it'd be a nice touch since forgotten ruins usually have at least some of it on them. I also had to change some things from the scan - I lowered his raised arm so it wouldn't stick out at an unusual angle (since in the original, Lelouch was lying on the ground so it did make sense) and tinkered with some other details like the chains on his arms and earring. Added some birds in the back and scattered the feathers a bit more around him so they wouldn't look so clustered. And that was basically it. Sounds like a piece of cake but it took me more than week to make this. Thanks to Kitten, Nysha, trofi and everyone else I showed this to for their feedback and love. Thanks for viewing and of course, feedback is welcome! Lol he looks like a porcelain doll. Which isn't a bad thing, I'm always amazed by your soft painting. The color scheme reminds me of your Uragiri wa Boku wallpaper. 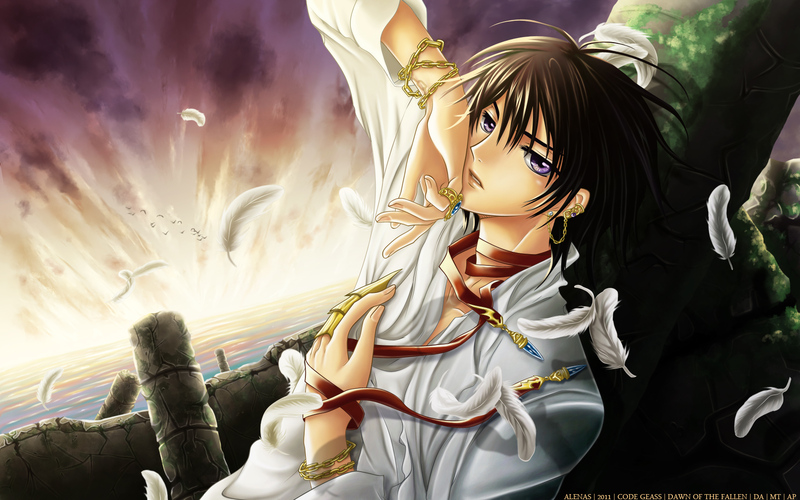 Lelouch looks so hot, yet so pretty in your wallpaper. Great work, I love it! Words such as perfection come to mind but the rest it blank. love the colors you used in here... <3 and your soft painting is really awesome! Holy.. ! That was amazing. Work you've done here. Background is .. I don't know how it I can say via English. i thought it was kamui as well. xD but i surely love it! just like another version of your Sleepless [Daybreak] wall. but its still great! Lelouch is so cool! i like this pic! Awesome to say the least, I have no criticisms and it's so nice seeing your works as usual Alenas :3 +fav! He look great! I love the way you handle this scan and create the background and his posture so that everything fit and look beautiful! I thought it was Kamui at first, too, since Lulu isn't looking as angular as usual - a huge improvement over a lot of the Code Geass scans. They're just so pointy! Anyway, your vectoring and painting are AMAZING. Great work on that ocean and sky, it's really, really nice, and I agree that moss is a nice touch. I don't know where there are flaws, it looks pretty much perfect to me. Great job! I'm sad that you won't be walling much in the future, but as a grad student I feel your pain.